MSU's Lambdin goes off for holding the stick, ending the Spartans' extended PP. Penalty: KILLED. #Badgers fight off the five-minute MSU advantage and have a minute left of the power play. One minute to play int he second, #Badgers putting tons of pressure on MSU and Minney looking for a late goal. End 2: Wisconsin leads Michigan State 3-1 on a pair of Luke Kunin second-period goals. Shots are 20-19 for UW. 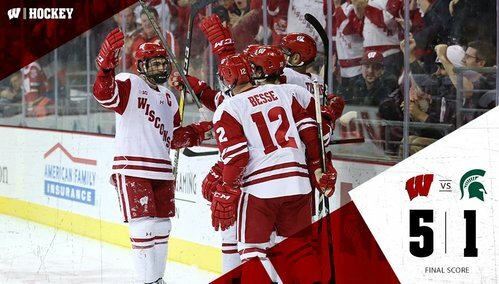 3-1 Wisconsin after 40 minutes. The third period is underway with Wisconsin leading Michigan State 3-1. Underway in the third, 3-1 Wisconsin. McGuire rips a shot in from the point but misses a bit high. #Badgers power play! Sanford called for interference with 17:15 to play. MSU's Sanford is called for interference with 17:27 left in the third. UW is on its fifth power play (1-for-4). Zimmer with a HUGE chance streaking across the front of the net but shoots just a little too quickly. MSU penalty expires shortly after. UW has a flurry on Minney around the end of the power play but the goalie keeps MSU in it with three saves. 14:49 left in 3rd, 3-1 UW. Media timeout after Minney stops a Soleway wrister. #Badgers leading in shots on goal, 25-21. Captain Kunin with a few great chances to start the third. Kunin tries to get himself a third, taking a wicked wrister from the top of the circles. 4-1 Wisconsin, 12:02 to play in the third. 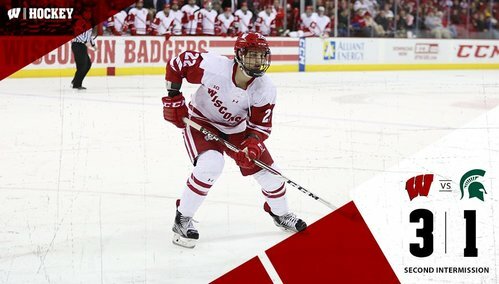 Badgers add to their lead 8 minutes into the third. 4-1 UW. BADGERS GOAL: A Peter Tischke shot from the point gets through for a 4-1 UW lead with 12:02 left in the third. Besse with traffic in front. Max Zimmer gets his second assist tonight, making this his first multi-point game with @BadgerMHockey . A great setup from Sexton and Zimmer leads to a beautiful goal! MSU's Stenglein is called for slashing with 9:57 left in the third. UW on its 6th power play (1-for-5), leading 4-1. Besse, Frederic, Kunin, Malone and Linhart on this PP for the Badgers. MSU gets a 2-on-1 chance but Ebbing's shot misses the net wide. The other UW power-play unit is Wagner, Johnson, Hughes, Zimmer and McGuire. Linhart's shot deflects off a skate and Soleway rings the post, but the #Badgers have been putting great chance on net all period so far. 5-1 Wisconsin, 5:01 to go. BADGERS GOAL: Matt Ustaski makes it 5-1 at the right post on a great feed from Wagner. 5:01 left in the third. You asked for it and @mustaski27 delivered!???????????????????? The Badgers have scored 5+ goals eight times this season, already one more than the previous two seasons combined (5 last year, 2 in 14-15). One minute to play, #Badgers ! FINAL: Wisconsin completes its first @B1GHockey sweep since 3/7-8/2014 with a 5-1 victory over Michigan State. The Spartans will travel to Penn State next weekend. MSU's Joe Cox: "I don't think the refs made a really good call on that. Coach Anastos made a really good argument on the bench to them." UW goalie Matt Jurusik: "I had the best seat in the house, and I know that didn't go over the line." Referees confirmed after the game that on-ice goal call was reversed because they felt they had replay evidence that puck never crossed. Referees have the ability to see a digitally zoomed image of the overhead camera, which they used on the play.